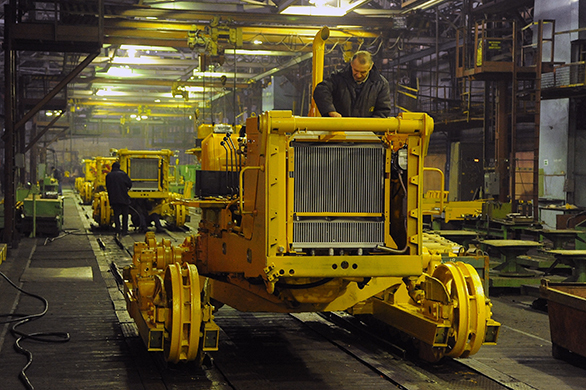 Chelyabinsk and Minsk tractor works have concluded a cooperation agreement. It assumes that the Russian company will master the production of Belarusian equipment, and the citizens of Minsk would enter production bulldozers South Urals. As the Deputy Director General of CTZ, Sales and Marketing Andrew Sentyabov, the result of negotiations between the two sides was an agreement that the first phase of the partnership will meet in Chelyabinsk Russia market research on the subject of the tractor "Belarus in 1502." At the same time continue the negotiation process with the opening of MTZ on his site assembly plant in Chelyabinsk bulldozers B10. If the market situation is favorable, CTZ, which is part of the corporation "Uralvagonzavod" will build "Belarus" in their areas. In turn, the DOLE will consider the prospects of a similar issue Chelyabinsk technology on its own. In addition, the parties agreed to establish a joint working group on the development of design documentation in order to achieve a reduction in the cost of production of engineering machinery. The specialists of the two plants will also think of the possibility of equipping tractors attachments for use in forestry and land reclamation. The experience of such cooperation with Belarus in CTZ is. Earlier Ming dealer company — the company "Monolittrans" — gathered bulldozers B-10M, which are made available to local authorities and road builders of the neighboring republic. Interest in Chelyabinsk technique also exhibit Belarusian reclamation and energy.